The tradition of making New Year’s resolutions dates back to ancient Roman times. But while the ancient Romans renewed their loyalty to their king each year, we today focus on renewing our own loyalty to ourselves—making resolutions to change our lives for the better. Common resolutions range from starting a new diet and taking up a new exercise regimen to seeking out a new job. But most of these resolutions fail, or at best, work for only a short period of time. So why not switch it up this New Year by making a resolution that will last a lifetime? Resolve to tackle that home renovation project you’ve been putting off. A nicely designed, built and organized mudroom is every Minnesota mom’s dream. Make that dream a reality in 2016! Whether it’s a split level with a small entryway or a two-story house with a large foyer, your home deserves a mudroom—a space where you can organize your outdoor wear and keep the outdoors from spreading throughout your home. Create just that space by working with a team of master custom cabinet makers. Looking to take your home remodeling resolution a bit further? Then how about gutting your old master bathroom vanity? Work with a master woodworker to design and craft master bath cabinets and a vanity that fit your daily needs and your design dreams. While a kitchen remodel is likely the most expensive renovation project you will tackle for your home, it is also one of the most rewarding. You finally get a kitchen that provides you with the right amount of storage and the proper layout to help you function at your best. Moreover, with custom kitchen cabinets, you also get the look you’ve always wanted. Since the kitchen is the heart of the home for most families, take the step you’ve been holding back on all this time—resolve to start your kitchen renovation in the New Year. What Is Your New Year’s Renovation Resolution? 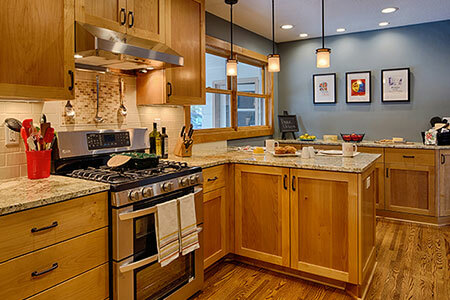 Which of these 3 home remodeling resolutions tops your to-do list in 2016? Let us know by commenting on our Facebook page. And share pictures of your favorite mudroom, master bathroom or kitchen with us via Pinterest. Most importantly, have a wonderful 2016! Hosting a Grad Party This Year? Now Is the Time to Start Remodeling!